Johns Hopkins Children’s Center and the PICU Up! program are featured in Parents magazine‘s 2018 list of the 20 most innovative children’s hospitals. The designation, based on a comprehensive survey sent to members of the Children’s Hospital Association, took into account each hospital’s proven track record of innovation leading to medical advances, as well as its adoption of the latest technologies and efforts to share discoveries with other pediatric centers so more children can benefit. Parents magazine notes that Johns Hopkins researchers are leading a worldwide movement to reduce sedation for the sickest pediatric patients, enabling them to get out of bed to do normal kid stuff. The PICU Up! program is based on research that shows kids sleep better at night and recover faster when they’re out and about, building towers, dressing dolls, and getting fresh air in the rooftop garden. They are even zipping around the halls of the pediatric intensive-care unit (PICU) on scooters. 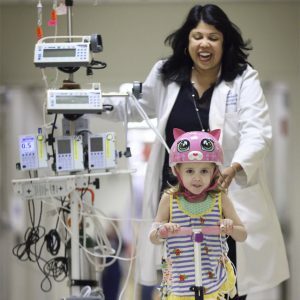 “We need to give kids an opportunity to be kids, no matter how sick they are,” says program director Sapna Kudchadkar, M.D. Click here to view the online article. It will also be featured in the October 2018 print edition of the magazine. Click here to learn more about PICU Up!